Heat oven to 400°F. Spray 9-inch square pan with cooking spray. Heat 10-inch nonstick skillet over medium-high heat. 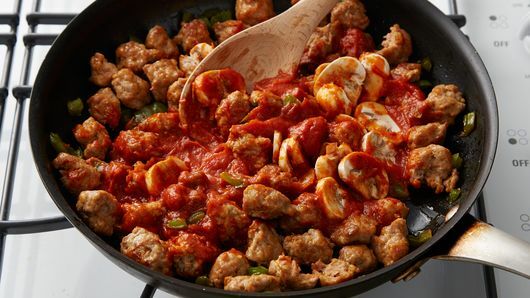 Cook sausage and bell pepper in skillet 7 to 9 minutes, stirring frequently, until sausage is no longer pink. Stir in mushrooms and pizza sauce. Keep warm over low heat. Unroll dough in pan. Press in bottom and up side of pan, folding edge under to form crust. Sprinkle 1/2 cup of the cheese evenly in bottom of crust. Spoon hot sausage mixture over cheese. Top with remaining 1 cup cheese, the tomatoes and olives. Bake 15 to 20 minutes or until crust is golden brown. Sprinkle with onions. Let stand 5 minutes. To serve, cut pizza into wedges with serrated knife. Check the grocery store meat department or an Italian deli for bulk sausage labeled sweet (mild) or hot. Keep refrigerated dough, such as pizza dough, chilled in the original package until you are ready to use it. Refrigerated dough is easy to work with when it is very cold. You don’t have to travel to the Windy City to enjoy a good slice of Chicago-style pizza, thanks to this deep dish pizza recipe. A unique take on pizza, deep dish pizza is fervently loved by Chicagoans, but it doesn’t look like your typical slice of pizza. Deep dish pizza is baked in a round pan that looks like a cake pan, which means the crust is deep, leaving space for a generous amount of sauce, cheese and other typical pizza toppings. 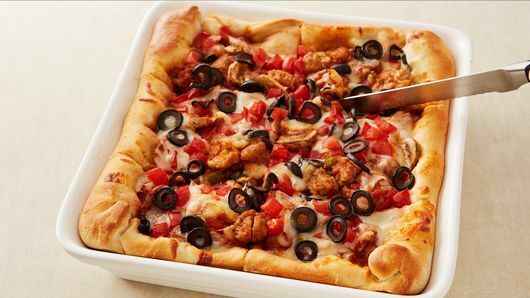 Baked in this format, deep dish pizza resembles a savory pie more than a flatbread. 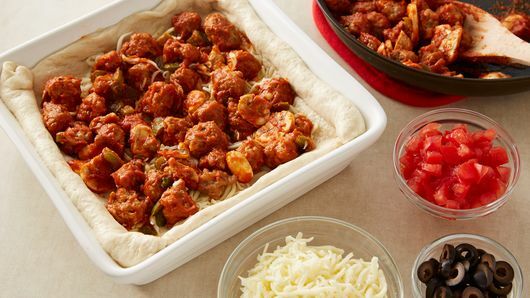 You can make quick work of the pizza crust in this recipe when you start with Pillsbury classic pizza crust. 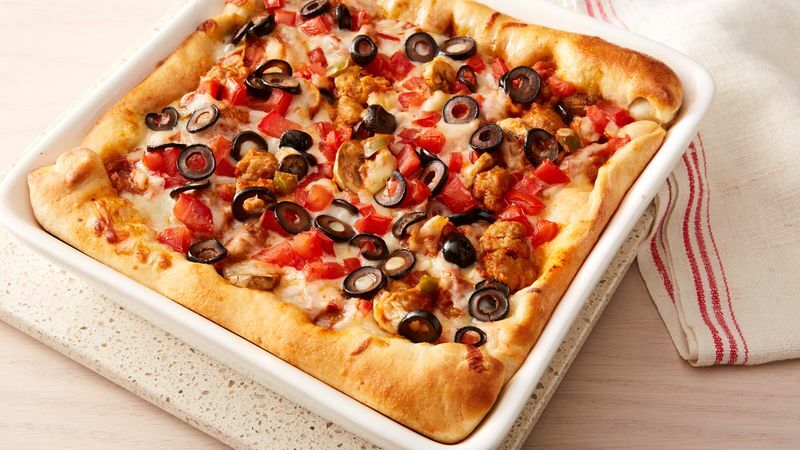 This recipe is baked in a 9-inch square pan, which isn’t the traditional round that you normally see deep dish pizza served in, but you will achieve the same thickness and taste associated with deep dish pizza. In this recipe, we call for sausage, green bell pepper, mushrooms, tomatoes, olives and green onions, but feel free to play around with the toppings based on your family’s preferences. Now that you’re an expert on deep dish pizza, read up on how to make all different kinds of regional pizza varieties in this article, or browse all of our delicious pizza recipes.